1Department of Statistics, Faculty of Mathematical Science, University of Tabriz, Tabriz, Iran. 2Department of Mathematics, Faculty of Science, Technical and Vocational University(TVU), Tehran, Iran and Department of Mathematics, Faculty of Science, Urmia University of technology, P.O.Box 57166-17165, Urmia-Iran. 3Department of Mathematics, Islamic Azad University, Central Tehran Branch, Tehran, Iran. 4Department of Mathematics, Faculty of Science, Urmia University of technology, P.O.Box 57166-17165, Urmia, Iran. In this paper, quadratic and sextic B-splines are used to construct an approximating function based on the integral values instead of the function values at the knots. This process due to the type of used B-splines (fourth order or sixth order), called integro quadratic or sextic spline interpolation. After introducing the integro quartic and sextic B-spline interpolation, their convergence is discussed. The interpolation errors are studied. Numerical results illustrate the efficiency and effectiveness of the new interpolation method. C.de Boor, A Practical Guide to Spline Interpolation, Springer-Verlag, New York, 1978. A.R. 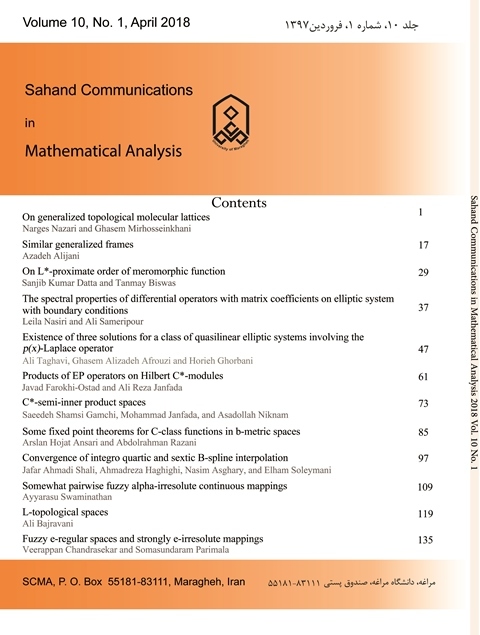 Haghighi and M. Roohi, The fractional cubic spline interpolation without using the derivative values, Indian Journal of Science and Technology, 5 (2012), pp. 3433-3439. H. Behforooz, Approximation by integro cubic splines, Appl. Math. Comput., 175 (2006), pp. 8-15. H. Behforooz, Interpolation by integro quintic splines Appl. Math. Comput., 216 (2010), pp. 364-367. F.G. Lang, X.P, On integro quartic spline interpolation, Appl. Math. Comput., 236 (2012), pp. 4214-4226. T. Wu and X.Zhang, Integro sextic spline interpolation and its super convergence, Appl. Math. Comput., 219 (2013), pp. 6431-6436. R.H. Wang, Numerical Approximation, Higher Education Press, Higher Education Press, Beijing, 1999. L. Schumaker, Spline Functions: Basic Theory, Cambridge University Press, Cambridge, 2007.